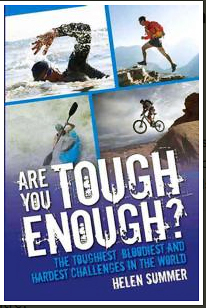 Are You Tough Enough? looks at over 60 of the most extreme marathons, triathlons, bike rides and other iconic endurance events from around the globe. This book offers massive highs and excruciating lows, showing just what we can achieve in pushing the bounds of human endeavour. Each year, thousands of competitors pit themselves against the elements, extremes of geography and their own psyches to take part in the world's hardest physical challenges. From the cold of the highest peaks to the unforgiving heat of the desert, by water, bike or foot seemingly ordinary people are undertaking extraordinary feats. Whether seeking to prove themselves as athletes, or attempting to escape the humdrum, one thing they all have in common is an unbreakable drive to test the very limits of their endurance. Are You Tough Enough? looks at over 60 of the most extreme marathons, triathlons, bike rides and other iconic endurance events from around the globe, taking in the hottest, coldest, highest and most remote locations, and the toughest, cruellest and wackiest challenges. With a detailed description of each event, featuring personal stories from competitors, this book offers massive highs and excruciating lows, showing just what we can achieve in pushing the bounds of human endeavour. Why Do One When You Can Do All Three...? Or Just Go Completely Crazy!